This flavorful dessert is summer, summer, summer! 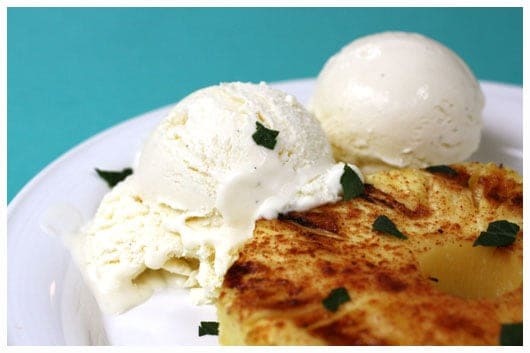 Warm Grilled Pineapple paired with cold and ultra creamy Coconut Ice Cream provide the perfect light ending to a summer meal. 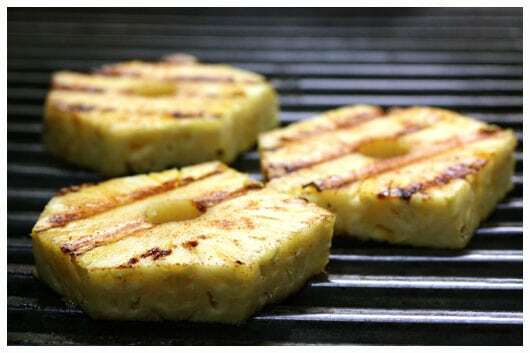 Our family really likes grilled pineapple, and we typically prepare it by simply sprinkling the slices with a little brown sugar prior to grilling. In this recipe, I kicked it up a bit with a sticky slathering of honey and a touch of cinnamon and cayenne pepper. The cinnamon adds a soft lovely warmth and the cayenne gives just a hint of heat – they are spectacular together! Add on a scoop or two of coconut ice cream, and this is one heckuva dessert! I was recently telling my sister, Jessica, that I had tried a recipe for coconut ice cream that was alot of work, and the end result wasn’t as impressive as I’d hoped for. She quickly chimed in that she had the easiest recipe ever for super creamy coconut ice cream. I had given her a Ben & Jerry’s ice cream book many years ago, and she simply replaced the half-and-half with canned coconut milk in one of the book’s sweet cream bases. There are only three ingredients! Three! And it’s fantastic! Do give it a whirl! Heat grill or grill pan to high. Lightly oil the grates or pan. 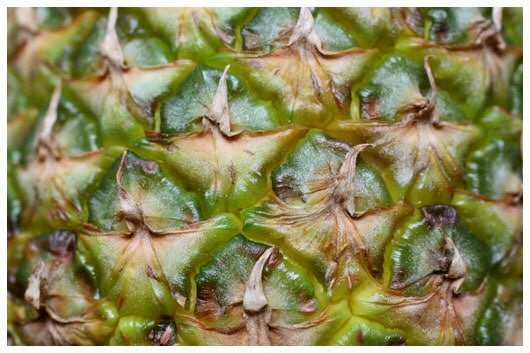 Drizzle honey over pineapple slices and then spread evenly with back of spoon. Sprinkle the cinnamon and cayenne very lightly over both sides of each slice. My family definitely likes more cinnamon and cayenne than the recipe specifies, so just tweak to your own tastebuds. Grill until light brown grill marks appear, only about 1 minute or so. Flip pineapple slices and turn heat off. Remove when the second side also has light brown grill marks. 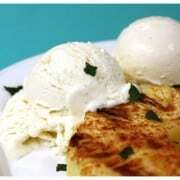 Serve pineapple warm with coconut or vanilla ice cream and a sprinkling of fresh mint. Pour cream into mixing bowl. Whisk in sugar, a little at a time, then continue whisking until completely blended, about 1 minute more. Pour in coconut milk and whisk to blend. Pour into your chilled ice cream container and churn until frozen.